Previous postHow Are You Shining? Thanks Mimi! Beautiful expression of you. Thank you so much! I value that!! You are quite right Passionista – loving unconditionally is quite empowering and liberating too! Thank you. I am so blessed with people like you who are with me in this quest! “…a bit batty…” How I remember this phase! Loved it! 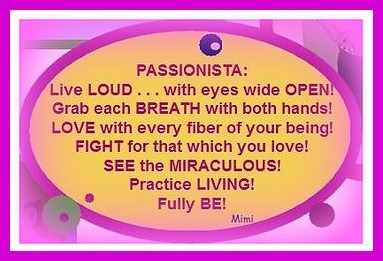 Love your post, Mimi! Ha, Mary Lou, yeah, common sense goes out the window.